Grab your flock and head to Fort Morgan this month for an unforgettable, one-of-a-kind opportunity to connect with nature along Alabama’s Coastal Connection. 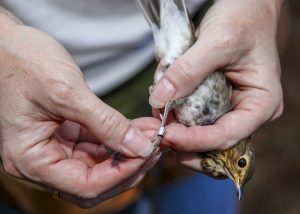 Starting April 18, the Coastal Alabama Bird Banding Project is back at the historical Civil War site. Researchers here are studying the migratory patterns of birds passing through the Coastal Alabama section of the Mississippi Flyway, one of four major routes North American birds take to and from their summer breeding grounds. The return of the bird banding project, originally championed by the late Bob Sargent of Hummer/Bird Study Group and his wife, Martha, brings together researchers, locals and tourists. Until April 22, adults and kids of all ages will enjoy rare access to migratory birds and those who research them while learning about the important conservation work happening on the Gulf Coast. Researchers Eric Soehren and Dr. Scott Rush, with backgrounds in avian conservation and gulf tidal-march ecosystems, respectively, will be available to answer all questions about the birds and how their work seeks to preserve them. 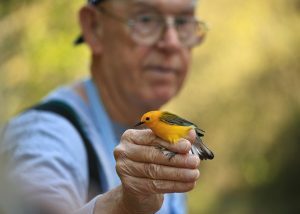 While the Coastal Alabama Bird Banding Project is open to the public free of charge, Fort Morgan charges an admission fee. The fort is open from 8 a.m. to 5 p.m., but bird viewing will end at 3 p.m.
For more information on this rare, up-close-and-personal opportunity, and for updates on all events along Alabama’s Coastal Connection, peruse our calendar of events.